Plenary Session: Gadolinium Deposition – How has Gadolinium deposition and Gd-associated toxicity changed the way it is currently used? After a year-long review process in which the deposition of gadolinium in the brain was considered, the European Medicines Agency announced suspension of marketing authorization for four linear agents in March. Will the FDA follow suit? In this session, Dr. Michael Tweedle will cover the historical development, as well as design and function principles, of Gadolinium contrasts. Dr. Shinji Naganawa will describe how Gadolinium contrast enters the brain, even without blood-brain-barrier disruption. And Dr. Harriet Thony will discuss how clinical practice has been effected. 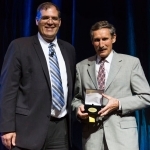 Young-Investigator Awards: Six trainee members will give 20-minute presentations based on a manuscript to JMRI or MRM, competing for the Moore and Rabi awards. Topics include CSF dynamics using phase-contrast, PET/MRI in Osteoarthritis, Left-Ventricular Mechanics using Cine DENSE, Hybrid MRI-ultrasound scannerless imaging, 13C Filtered 1H imaging of PEGylated Biomacromolicules and Free-Breathing volumetric fat/water separation. These presentations are being live-streamed across the world! MR Value Presentations: This session continues ISMRM Value Initiative, starting with two invited talks on how fast imaging can improve value, and how MR value relates to the broader health system. 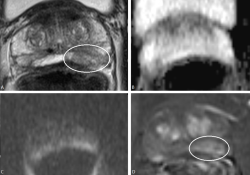 These are followed by short proffered papers studying high-value MRI. Note there is an upcoming ISMRM Workshop on High-Value MRI Feb 18-20 in Washington DC, USA. Joint ISMRM-SMRT Forum: Assessing Implant Safety: This interactive session will explore manufacturer device testing for MRI safety, including risks of devices and implications for high-field scanning. Sunrise Educational Sessions: Rise and Shine! Educational sessions on specialized topics are on everyday this week at 7am. PI-RADS Yes or No? will give a comprehensive review of the clinical challenges and implications of assessing prostate cancer with PI-RADS, including pros and cons. 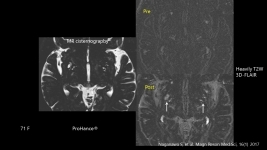 White Matter and Connectivity in TBI: Several studies using MRI indicate long term changes in brain structure after sports-related injuries that will fuel further investigation. Manuscript Reviewing for JMRI: Room 314 18:30 – 19:15: General considerations, single- and double-blind reviews, decision categories, manuscript expectations, and common errors. 7T Neuroimaging Power Pitch: (Power Pitch Theatre B, 8:15-10:15am),While momentum increases for the use of 7T MR in several brain applications, high field MR is also gaining traction outside of the brain. Taso et al (#18) use 7T to generate multiparametric templates of the cervical spinal cord, with T2* maps that depict cord cyto- and myeloarchitecture. #0096 Flexible technique for flow sensitive fat suppressed high resolution peripheral nerve imaging: (10:03am, Room 316A) A flow-sensitive 3D fast spin echo pulse sequence with Dixon-based water-fat separation and compressed sensing for robust and efficient peripheral nerve imaging. 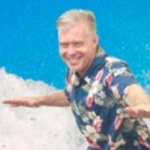 #0074 Mitigating the effect of magnetization transfer in Magnetic Resonance Fingerprinting: (9:39 AM, Monday April 24 in Room 3140) Hilbert et al. explain magnetization transfer is a potentially important consideration for MRF and could also represent an additional opportunity for parameter quantification, and thus this talk should be of strong interest to those interested in MRF, MT, and relaxometry. #0080 Effects of RF pulse profile and within-slice phase dispersion on accuracy of MR fingerprinting with balanced SSFP readout. (8:51 AM in Room 315). Drs. Chiu and Bock and a team from National Taiwan University and University Medical Center in Freiburg discuss the effects of RF pulse profile and within slice phase dispersion on the MR Fingerprinting (MRF) experiment, important considerations in MRF. 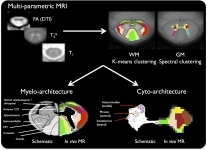 Individualized Brain MRI: Building a Neurosurgical Toolbox: (313BC, 7-7:50am) White matter tractography and functional mapping of eloquent cortex are now considered essential tools for surgical planning for brain tumor resection. 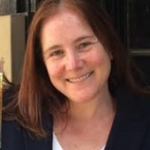 Shawna Farquarson and Vivek Prabhakaran will share practical pearls and pitfalls to illustrate how these techniques are effectively translated and used in clinical practice. New MR tools to evaluate patients with stroke: High-resolution vessel wall imaging techniques are now being applied in stroke, carotid plaque and intracranial atherosclerosis. As Okuchi et al (#273) show, acceleration with compressed sensing offers considerable reductions in scan time without compromising the ability to see plaque. Come to afternoon session Stroke and Vessel Wall Imaging in Room 310, 4:15-6:15pm to hear the latest. 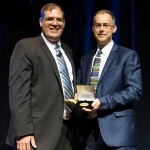 Sunday Awards: The ISMRM Gold Medal Award was awarded to Dr. Felix Wehrli (University of Pennsylvania) and to Dr. Mark Griswold (Case Western Reserve University). 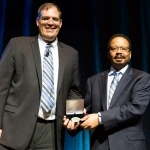 The ISMRM Distinguished Service Award was awarded to Dr. Roderick Pettigrew, Director of the National Institute for Biomedical Imaging and Bioengineering (USA). 15 years ago, at the 2002 meeting here in Honolulu, Dr. Paul Lauterbur gave the Lauterbur Lecture, entitled, “From Beginnings to Maybe.” Dr. Lauterbur receiver a standing ovation for his lecture, and of course received the Nobel Prize in 2003, together with Dr. Peter Mansfield. Great meeting so far. Come to the plenary session to learn about the latest on Gadolinium Deposition. Excited to unveil my pet project for Honolulu: the Secret Sessions. Off-program content designed just for you. Only in our secret location: The Resonarium!